Number of deaths due to Ebola virus has mounted to 1000+, WHO has declared this as an International emergency. Ebola is widespread in North Eastern Africa, mainly in Liberia, Sierra Leone and Nigeria etc. With precautionary measures govt has asked to check everyone coming from affecting countries and is expected we have one confirmed case in Pune. So, it's better we at least know its symptoms and precautions we can take to protect ourselves from this deadly virus. It is as dangerous as you can think, according to doctors it can be transmitted even through eye contacts, sweat of person affected, saliva and almost everything you can think of. So the patients suffering from Ebola virus are kept at complete isolation and doctors treating them need to wear special mask. 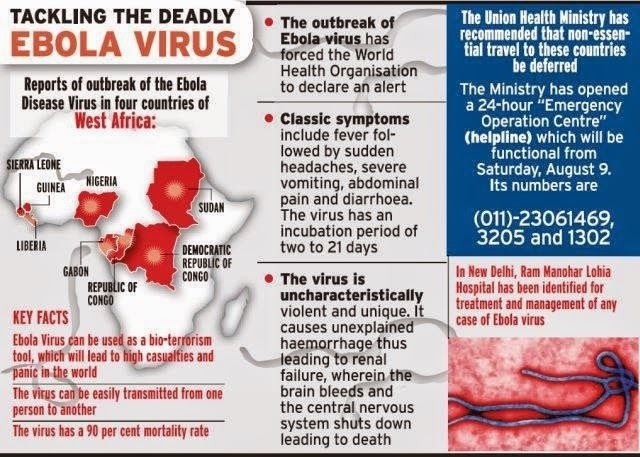 Here is one picture describing the must to know facts about Ebola virus.